Just 15km east of Bundaberg, Queensland, Australia one of nature�s great events takes place. Each year, Loggerhead, Green and Flat-back turtles lay their eggs in the safety of the sand at Mon Repos Beach and a few months later their offspring emerge from the sand and make their way towards the water � the beginning of an epic journey to the East Australian Current. Kieren and I had contacted the Mon Repos Conservation Park to get permission to use lights to take photos and videos of loggerhead hatchlings, which make up the majority of Mon Repos�s hatchlings. Our �light girl� Arielle, a member of Griffith University�s dive club, Kieren, his wife Jen, their son Carter and I made the four-hour drive from the Gold Coast to Marysborough, where we stayed with our diving friends Rod and Karen. It was another hour�s drive to Mon Repos the next evening for the turtle hatching. Mon Repos means �my rest� in French and although it�s a great name for a tropical resort, there�s no rest taking place on the beach for the turtles. When the adult females come to lay their eggs (November through January), it�s a marathon journey during which they must swim inshore, haul their heavy bodies up the sloped beach and dig out a hole for their nest. That�s all before they lay 100 to 150 eggs. Then they must cover the precious eggs with sand and carefully make the nest look as inconspicuous as possible so as not to attract predators. Gravity is in their favour on the way back to the water but it�s still a hard slog, anyone who goes walking or running in soft sand can attest to that. And the hatchlings don�t have it any easier. 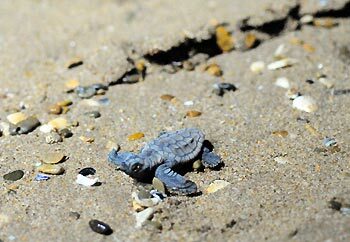 The 50 cent piece-sized loggerhead hatchlings break out of their protective eggs and then must climb over their brothers and sisters to get out of the nest. With our tour group assembled in a circle around a nest that had been identified as ready to hatch by the park rangers, we eagerly waited for the first tiny grey head to poke out of the sand. It didn�t take long and soon there were at least 100 hatchlings clamouring over each other in the holding area the rangers use to keep the hatchlings safe from the wayward tourist�s foot. 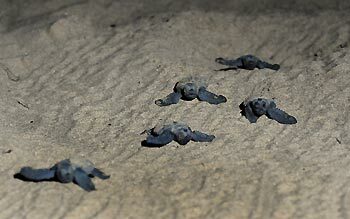 While one of our guides tells the group all the facts and stats and answers questions, the other counts the hatchlings. Five are plucked out from the group to be photographed by the group. 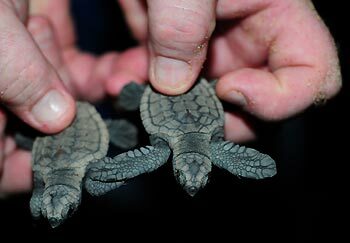 Researcher Dr Col Limpus determined this number is small enough so that it doesn�t adversely affect the hatchlings while at the same time allowing visitors to touch and photograph the turtles they came to see. It is hoped this up close encounter promotes conservation and awareness. It�s finally time to let these eager turtles do what they�re programmed to do � get to the water. The group lines up to form a sort of runway lit up with torches. 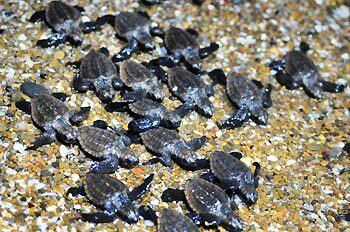 A few of the kids are chosen to stand with their legs wide so the hatchlings go through their legs as they clamour down to the water. Kieran, Arielle and I stand at the water�s edge with our cameras and the bright video lights to help lure the turtles into the surf. They all seem so determined and they�ll need to be. Only one in 1000 of the hatchling survives long enough to breed. Just getting past the half metre swells looks like an arduous enough task, but once they hit the water the hatchlings don�t stop swimming until they reach the East Australian Current. The visitor centre and research station at Mon Repos were set up to protect and rehabilitate the turtle rookery, which is the largest mainland loggerhead rookery in the South Pacific. Non indigenous wildlife like red foxes wrecked havoc on the nests and even with their current protection the population is not expected to recover until 2020. You can do your part by going on the Mon Repos turtle experience, not using plastic shopping bags, participating in beach clean ups, supporting turtle conservation and sustainable coastal development.